Do you want to live a long and satisfying life? Did you know that God wants you to live long and strong? What does the Bible actually mean by long life? Very few people are aware that there are promises from God on the subject of living a long life. Although there is much teaching on divine healing, there is very little on living in divine health. 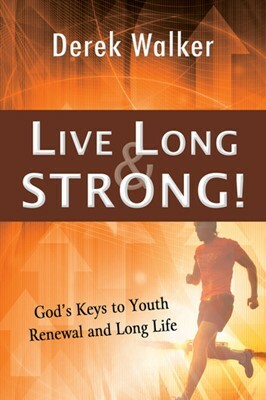 In Live Long and Strong, Derek Walker addresses this lack, providing the first in-depth study of all that the Bible has to say on living a long life. However, God also says, “My people are destroyed for lack of knowledge” (Hosea 4:6). If you do not hear God’s Word on a subject, you will not have faith to receive His promised provision in that area. Live Long and Strong introduces you to the wealth of Scripture on long life—fully persuasive of God’s will for your life. This book will renew your mind and build your faith to receive His health, strength, and youth renewal. It imparts wisdom you need to see His promises come to pass. Your life will be lengthened and strengthened for the glory of God! Is There an Appointed Time to Die? Why Believe for Long Life? What About Believers Who Die Young? What a privilege to be asked by my dear friend, Pastor Derek Walker, to write a few words by way of an introduction to his latest book. I have known Derek for several years and have been deeply blessed by his spirituality, depth of knowledge, and remarkable teaching ministry. When I have struggled to understand certain truths and have turned to him for advice and help, I have never been disappointed and I have learned to trust his counsel and wisdom. Derek has the uncommon gift of being able to teach about high and sometimes complex concepts in the Lord with clarity that is easily understood. In this latest book, Derek has brought us back to the biblical truth that God wants to bless us with a long and fruitful life. Today’s emphasis on healthy eating and living in order to live a long life is incomplete without God’s clear instruction in His Word on how to live a long life. This is an important and challenging message coming at a time when the enemy of our souls wants to attack and to cut short the life of God’s people. Recently Billy Graham, at the age of ninety-two, made the statement that he was prepared for death but had never been prepared for old age. In this book, Pastor Derek encourages me, as I grow older, to increasingly depend upon God for my strength; and as I trust Him, I will continue to be useful all the days of my life. I have been encouraged and strengthened by the wisdom in this book. I encourage you to read it with an open mind and to allow God to speak directly to you, and then to rise up in faith, believing what God says and stand upon His promise of long life. If you do this, I know that you will be blessed in the same way that I have been blessed. Thank you, Derek, for this timely challenge. Missionary statesman Michael Ross-Watson and his wife, Esther, have served the Lord together for more than forty years. They served as missionaries with WEC International in Indonesia. Michael has been a pastor, teacher, and missions director. He is Honorary Pastor of the large Anglican Church of our Saviour in Singapore.